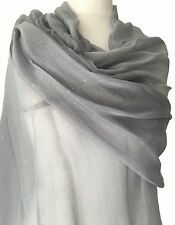 Large grey sparkly light weight wrap, it has tiny silver sparkly flecks on the fabric which catch the light and give a slight sparkle to the fabric. Large cream coloured light weight pashmina wrap / scarf, beautiful and soft silk blend sheen fabric ( 30% silk, 70% viscose ) faux pearl detail to the edges. 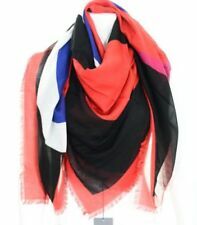 Designer Inspired Scarf/Pashmina - Black Background with Chain Print, Hearts, Handbags etc - Scarf/Pashmina. Beautiful design. Very versatile and can be worn in so many ways and can will easily glam up an outfit in an instant. High quality design Pashmina, with soft, light weight 52% acrylic 48% viscose fabric. As a result, we withdraw Pashminas, even for very minor faults such as a pull, or small hole or mark. Many people who have bought our Seconds say they can't see the fault at all. PASHMINA LADIES PRETTY SCARF. IT'S MADE FROM A LOVELY QUALITY SOFT MATERIAL IN A VERY ELEGANT STYLE ♥. Bold stripes in Green and Red. Feels such a Luxurious Quality - feels like 100% Silk but it’s a blend of Silk and Polyester. Silky soft and cool which feels so beautifully soft against the skin (whether you wear it as a Scarf or over Swimwear). Leopard Print Design Scarf / Shawl. Elegant and luxurious, long and wide making a great addition to any winter outfit, or fabulous as an evening shawl accessory. Lovely slightly Pinky Beige with Cream and Charcoal Grey colours. Scarf/Beach Wrap in 100% Silk. Silky soft and cool which feels so beautifully soft against the skin (whether you wear it as a Scarf or over Swimwear). Very versatile and can be worn as a Beach Wrap, Sarong, Beach Dress, Cover Up or a Scarf. STUNNING LADIES LIGHT BLUE PASHMINA. LONG SCARF. PRETTY OCCASION WEAR. Designer Inspired Pashmina/ Scarf with stunning Rope Design, Cream Background with Black borders. Such a Luxurious Quality - feels so soft and silky. 100% Silk and so Luxurious both the quality and the look. Wear as a Pashmina over a Dress or to glam up any outfit. Perfect for the Party season. Oversized and long. Can be worn in many ways. Beautifully soft against the skin. Wrap yourself in amazing softness and luxury. In good condition. Hand wash. 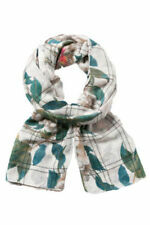 So versatile and can be worn in many ways, Scarf, Pashmina, Scarf, Beach Wrap/Sarong or Shawl. I have added a few photographs showing the various ways it can be worn but it’s very versatile. Rectangle in shape and a very good long length. High quality design Pashmina, with soft, light weight 52% acrylic 48% viscose fabric. These are beautiful, high quality shawls/pashminas/scarves from CJ Apparel, and are ideal for weddings & parties. Beautiful large peacock feather design. Navy, pale blue, white. 100% Polyester. Makes a perfect gift. Washable none Iron. Cream Designer Inspired Chain Link Print which is Oversized - Scarf, Pashmina, Shawl, Beach Wrap, so soft, silky and cool. Stunning and on trend, in fact it never goes out of fashion. Very versatile and can be worn as a Pashmina, Scarf, Shawl, Wrap, Beach Wrap, Sarong or Beach Cover Up. Silky soft and cool which feels so beautifully soft against the skin (whether you wear it as a Scarf or over Swimwear). Very versatile and can be worn as a Beach Wrap, Sarong, Beach Dress, Cover Up or a Scarf. STUNNING LADIES MULTI COLOUR PASHMINA. LONG SCARF. PRETTY OCCASION WEAR. 55% Pashmina 45% Silk. Rectangle shape. Self fringing on either end. I try to describe the item in as much detail as possible. Navy blue with mustard gold/yellow. Makes a perfect gift. New in for the new season. 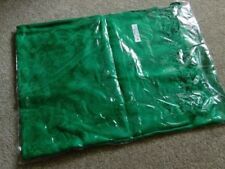 Supplied in sealed poly bags. Classic Polka Dot Spots. Black and white. A color combination that works perfectly together. New in for the new A/W season. Supplied in sealed poly bags. The pashmina drapes and falls beautifully, it can also be worn as an oversized scarf, very versatile - the perfect fashion accessory, stunning ! Monsoon embroidered & beaded Pashmina, shaded from light to darket purpley blue with fringing and lining on back across the embroidery, classy & elegant. Discover this wide array of elegant rectangular pashminas. These classic pashminas are great for achieving a timeless look. Designed to keep you warm, these pashminas will be great for wrapping up whenever you're feeling a little cold. They can be wound around your neck in different ways and are available in different lengths, giving you a wider array to choose from. With an easy-to-wear design, rectangular pashminas are great for styling in many different ways, making them both trendy and versatile. Warm and cosy, wool blend pashminas are the ideal wintertime accessories. They are made from stretchy material for total flexibility. Thanks to their casual design, polyester pashminas are great for adding a laid-back staple to your look. These pashminas have a smooth texture for an elegant design and a comfortable feel.